As thirumangai AzhwAr thought of the nature of the samsAram (this world), he became very sad. When was he involved in samsAram and went through its difficulties? 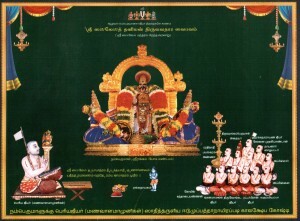 During his periya thirumozhi anubhavam, AzhwAr was deeply involved in the experience of dhivya dhEsams. perumAn wondered whether AzhwAr has forgotten about srIvaikuNtam, and so showed him the nature of this samsAram. AzhwAr felt the true nature of this samsAram and in the last padhigam of periya thirumozhi – mARRamuLa – and sang how he is suffering in this samsAram like an ant surrounded by burning firewood, and so on. To reduce that angst, AzhwAr sang thirukkuRunthANdagam, where he involved emperumAn through his words, thoughts, actions, falling on His feet, etc., (vAkkinAl karumam thannAl (4)). Doing that is the medicine out of this samsAram. He got determination (vairAgyam) and felt that he spent all these days doing other things. emperumAn asks him, “What do you need from me for your suffering due to being in this samsAram?”; AzhwAr replies, “Please completely rid me of the samsAram, without any scent/trace of it, as it prevents us from enjoying You”. When replied – “Is it something that I could do?”, AzhwAr says, “Everything other than You is created and protected by You; You are responsible for them, everything surrenders and depends on you to protect them, so only You can remove us from this samsAram and we cannot remove it ourselves.”. There is nothing of the sort where we protect ourselves and you mind your business. If I had the ability to protect myself I would have easily gone to srIvaikuNtam. You are our swAmi – all the AzhwArs have said this and accepted this; they have accepted that they are your property. unnAlallAl yAvarAlum onRum kuRai vENdEn (thiruvAimozhi 5-8-3) – nobody else need to do the good for me, and they can’t do it either. Do not show me to myself for protection. Saying so, thirumangai AzhwAr falls on the divine feet of thirukkudandhai ArAvamudhan and announces to him his predicament and status. The whole prabandham is sung to thirukkudandhai ArAvamudhan. 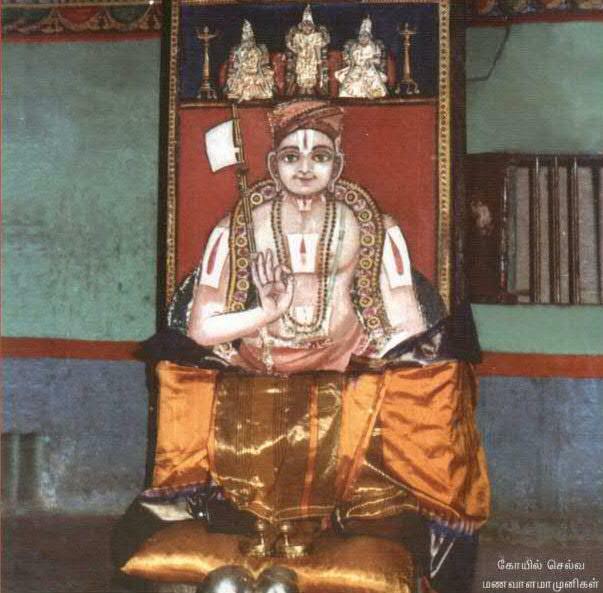 nammAzhvAr too sang a thiruvAimozhi (decad) to this emperumAn in (5-8) – ArAvamudhE adiyEn udalam, and performed saraNAgadhi to this emperumAn. ~ ~ ~ ~ end of avathArikai of first vyAkyAnam. There is something unique about this prabandham related to its vyAkyAnam by periyavAchAn piLLai. After he completed kAlakshEpam (lecture series) of the prabandham, a group of srIvaishNavas joined later and prayed the AchAryan to do kAlakshEpam for them again. Swami with his nirhEthuka krupai (causelss mercy), provided them the vyAkyAnam again, only this time it is with more samskritham (sanskrit) words, and with additional content! This is similar to his own AchAryan, nampiLLai: for thiruvAimozhi, eedu 36000, the introduction is multi-fold and are referred to as ‘first srIya:pathi padi, second srIya:pathi padi, and third srIya:pathi padi’, for the same reason of more srIvaishnavas joining the kAlakshEpam in the next days. The second vyAkyAnam of thiruvezhukUtRirukkai by periyavAchchAn piLLai is referred to as “parama kAruNikarAna periyavAchchAn piLLai, menakkitta srivaishNavarukkAga sAththi aruLina vyAkyAnam” (~ vyAkyAnam provided by the most kind periyavAchchAn piLLai, for (more) srIvaishNavas who requested him for it). The 2nd vyAkyAnam of the introduction (avathArikai) is as follows. In the first vyAkyAnam where it says ‘ you are the one who created us’, in here there is more explanation of that too. We were without any faculties, and surrounded by thamas (matter during praLayam? ), without any knowledge (gyAnam), and were similar to achith (non-sentient), and were sticking in Your lotus feet similar to achith. You saw these, and without our requesting You, provided us the faculties, due to your kindness towards us, and due to Your ever-existing relationship with us. Like said by ALavandhAr in sthOthra rathnam (10), ‘amUni bHuvanAni bHavithum nAlam’ – ‘these worlds would not be created’, without Your blessing us. Starting from our being itself is under your control, so does it not go without saying, that without You there is nothing that we can attempt for betterment or otherwise. (nammAzhwAr saying ninRananar irundhanar … ninRilar irundhilar (thiruvAimozhi 1.1.6), to mean the same). When there is nothing in my control, You who made me has to figure out a way, and there is nothing to discuss about me protecting myself. 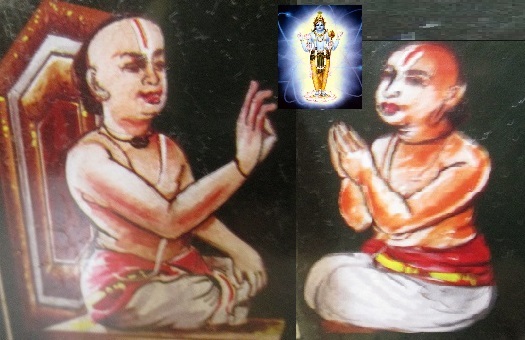 Same is said by poigai AzhwAr in his mudhal thiruvandhAdhi (60): charaNAmaRai payandha. All, including the highly knowledgeable chathurmukan (brahma), and all sentient and non-sentient would look for you to protect them, You who is holding the divine conch in your hands for the protection of your devotees. They would not know about protecting themselves from this samsAram. Similarly nammAzhvAr pleads: uNdittAi ini uNdozhiyAy – (thiruvAimozhi 10-10-6) – you created us, and why have you stopped/are delaying from taking us to you? emperumAn: when there are so many knowledgeable ones like vasishtar, viswAmithrar, how can you say there is no one who knows how to protect themselves? AzhwAr: Like it is said: naiva kinchit parOksham thE prathyakshOsi na kasyachith | naiva kinchidhasidhdHam thE na cha sidhdHOsi kasyachit (jithanthE 1-6), [ there is nothing you do not know; you are not known fully to anyone (with their own efforts); You are not attainable to anyone (with their own efforts) ], You who knows everything, there is nothing that you do not know or cannot attain; how much ever knowledge and ability (gyAnam and sakthi) some of us may possess, You are not fully knowable or attainable by us (by our own efforts). Consider this example: there is one person who is blind, and cannot walk either; another is having very good sight and is able to walk well. Unless the second one helps and shows the way for the first one, the first one cannot do anything by own self isn’t it? I am without knowledge and ability, you are the one who knows everything and possesses all the abilities; given that, You are the one to take action and achieve this, and is there anything like my doing something and achieving it? Even if I try to understand with the knowledge given by you, do I have the strength/ability to achieve the goal (of reaching srIvaikuNtam). I cannot reach you with my gyAnam; the knowledge I got is the knowing that You are the means to reach You. (It is not like emperumAn is denying to AzhwAr; AzhwAr is saying this for us; is there anything we can do? Yes, like how a child would cry when the mother goes out of sight, we can only cry for His mercy to get us out of this samsAram). End of avathArikai from second vyAkyAnam. This entry was posted in iyaRpA, thiruvezhukURRirukkai and tagged 4000, azhvar, azhwar, dhivya, divya, english, introduction, jeeyar, jIyar, kaliyan, kutrirukkai, meanings, naalayira, naalayiram, prabandham, thirumangai, thiruvezhikURRirukkai, thiruvezhu, vyakyanam on May 27, 2015 by raghuram. No specific introduction for the decad. In this world, one can be seen through the eyes and served through the hands. But how can we who are most insignificant worship sarvEsvaran who is beyond our senses? When some one develops desire to worship emperumAn hearing his glories, emperumAn would himself manifest as rAma, krishNa, etc., avathArams yuga after yuga to fulfill their desires and accept their worship. Though he is born in human form, he descends with his most auspicious qualities, divine spiritual body, etc., out of his unlimited mercy to protect his devotees and to annihilate the enemies of such devotees. His auspicious qualities shine in his avathArams even more than parathva state (in paramapadham). No one can understand the greatness of his avathArams and the purpose of the same. When some kind-hearted persons dig a lake/pond, it will be beneficial for some and tragic for others. Similarly, these avathArams of emperumAn are uplifting for the devotees and destructive for their enemies. nammAzhwAr starts with these principles that are explained in srI bhagavath gIthA 4th adhyAyam and tells “since he is so easily approachable, he can be approached and you approach him now”. In the first decad 10th pAsuram, meaning of nArAyaNa sabdham (word) is hinted in “nIrthoRum paranthuLan” (pervaded in every drop of water) and in the second decad 10th pAsuram “nArAyaNa” word itself is revealed in “vaNpugazh nAraNan” (nArAyaNa who has great qualities). So, in line with all of sAsthram which declares in “thathvam nArAyaNa: para:” (nArAyaNa is ultimate truth) and “dhyEyO nArAyaNas sadhA” (always meditate upon nArAyaNa), it is established firmly that srIman nArAyaNan is the thathva (truth) and hitha (process/means). nammAzhwAr starts enjoying the glories of emperumAn‘s avathArams in this decad. In the first decad, nammAzhwAr said “emperumAn is the supreme lord”. In the second decad, he said “worship him because he is the supreme”. Can a person who does not have both hands climb an elephant? Similarly, can the most insignificant jIvAthmA who is bound in this world approach sarvEsvaran who has no unfulfilled desires? If the elephant itself facilitates the person who does not have hands, then he can climb on the elephant. Similarly, if emperumAn facilitates himself to accept the worship of the jIvAthmA, then the jIvAthmA can worship him. avathArams (incarnations) are common for both unfortunate and most fortunate ones – the unfortunate ones treat him like a normal human being and become losers; the most fortunate ones being amazed at him (for being born as a human being out of great compassion even though he is the supreme) and be uplifted. emperumAnAr told embAr “If we say ‘sarvEsvaran is supreme’ many people shy away from him out of fear, so we explained his easy approachability. Some gave up on him considering ‘he is so simple’. But you are the only one who greatly appreciates his simplicity”. When a kind-hearted person digs a lake/pond, some may drown and kill themselves while others may quench their thirst and be fulfilled. When a lamp is lit, some fire-flies fall in it and kill themselves while others benefit from the light given by the lamp. emperumAn too is glorified as light (knowledge) giving lamp in many pAsurams such as periya thirumozhi 4.3.8 “vEdha nal viLakku” (the auspicious lamp revealed in vEdham), thiruppAvai 5 “Ayar kulaththinil thOnRum aNi viLakku” (the shining lamp of the cow-herd clan), perumAL thirumozhi 10.1 “venkathirOn kulaththukkOr viLakku” (the shining lamp of sun dynasty). Even in this avathArams (where he presents himself so simply), sisupAla, pUthanA, etc., fought with him and were destroyed. But many were uplifted by him in his avathArams. Some one asks AzhwAr, “you told us to worship him many times”. But we cannot see him unless we worship him and we cannot worship him unless we see him. What is the solution for this? Here, AzhwAr is not talking about sAdhana bhakthi which is explained in muNdaka upanishath “…thasmin dhrushtE parAvarE” (When that supreme lord who is well-known from vEdham is seen, the attachments for worldly pleasures in our heart will be removed and all our doubts will be cleared. The karmA of such jIvAthmA who has seen emperumAn will be removed) and srI bhagavath gIthA 18.55 “…visathE thadhanantharam” (One who fully understands my nature and qualities through parabhakthi (full devotion), he realizes me through such devotion and reaches me subsequently). This sAdhana bhakthi is very difficult to practice. Here AzhwAr is talking about having the minimum desire to worship emperumAn and emperumAn being available for them to accept their devotion. When he descends into the material world as humans, etc., he is not bound by karmA. Instead he descends out of his own desire/will. 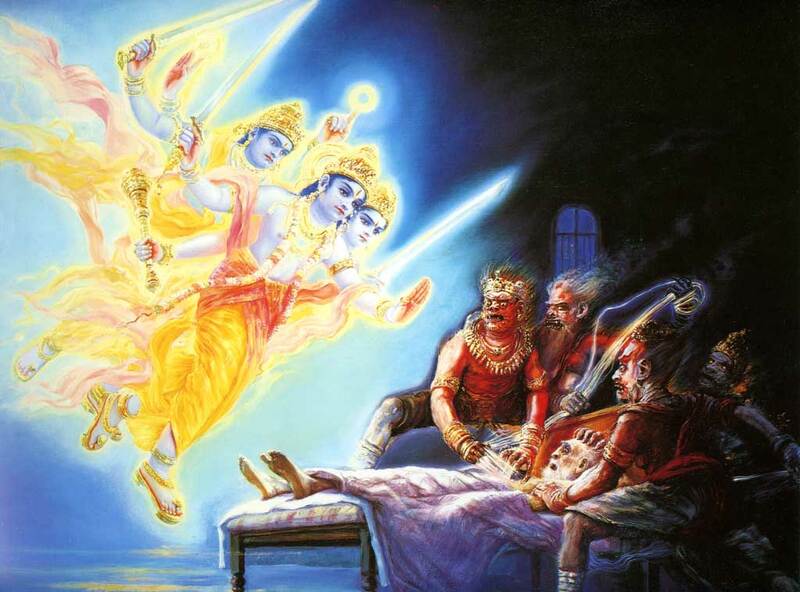 He himself explains that he descends in many many forms in srI bhagavath gIthA 4.5 “bahUni mE vyathIthAni…” (Oh destroyer of enemies (arjuna)! I have also taken many births and you have too. I remember all my births but you do not). He further explains his avathAra rahasyam (the purpose of his incarnations) in gIthA 4.9 “janma karma cha mE dhivyam …” (My birth and activities are divine) – my births are not out of karmA but out of my desire; Even when I am born I am unborn; Even when I am born in these simple forms, my supremacy remains with me; I have imposed my divine body in these material forms; One who knows any of these will not be born again in this material realm; Do they have to be born even after my birth (my birth is to eradicate their birth)? Are there two supreme persons (i.e., can others override my desire/will)?” – It is highlighted in arumpadham that nampiLLai explains this sequence keeping gIthA slOkam 4.6 “ajOpisan“). Thus, depending upon the principles explained by kaNNan emperumAn in 4th adhyAyam of srI bhagavath gIthA, AzhwAr explains that emperumAn descends in avathArams such as srI rAma, krishNa, etc. and is most easily approachable. So, you all, approach him. Even amongst the avathArams, krishNAvathAram is the pinnacle of nIrmai/saulabhyam (simplicity – easy approachability). Even in that, skipping those aspects which reveal his supremacy, AzhwAr is focussing fully on nagarakshOba (disturbances in the town) due to his navanIthachaurya (butter theft). 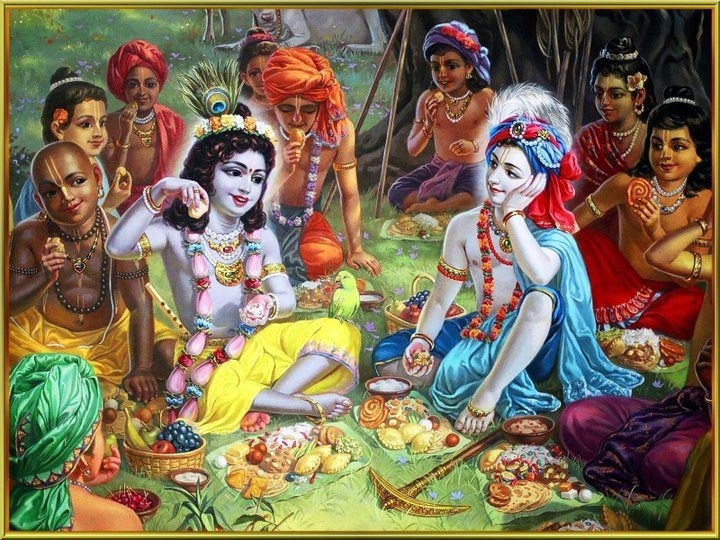 Though AzhwAr was focussed on instructing others, due to having a tender heart, he became mesmerized in krishNa’s butter theft and became speechless. After meditating on his parathvam (supremacy) in the first padhigam, AzhwAr was clear (about the philosophy, etc) and instructed others in the second padhigam. But starting to think about his saulabhyam (simplicity), AzhwAr became bewildered and fainted immediately. This entry was posted in thiruvAimozhi, thiruvAimozhi 1st centum on May 24, 2015 by Sarathy Thothathri. In the end, nammAzhwAr says that these 10 pAsurams are told by him after analysing the 1000 pAsurams in thiruvAimozhi which reveal the auspicious qualities of bhagavAn. Subsequently, nammAzhwAr says that the result is to understand the most admirable nature of this thiruvAimozhi (decad) among the whole prabandham. In the first pAsuram, nammAzhwAr said that one should agree to submit oneself unto emperumAn after giving up attachments to other aspects. In the second pAsuram, nammAzhwAr said that after understanding the defects of other (worldly) aspects, one can easily give them up. In the third pAsuram, nammAzhwAr highlighted the nature of what is to be given up briefly. In the fourth pAsuram, nammAzhwAr highlighted the glories of emperumAn who is to be pursued. In the fifth pAsuram, nammAzhwAr highlighted the remedy for the internal hurdle which can occur while pursuing emperumAn. In the sixth pAsuram, nammAzhwAr explained that emperumAn naturally likes to mix with others. In the seventh pAsuram, nammAzhwAr said that once we have true knowledge about the relationship with emperumAn, one can easily bond with him. In the eighth pAsuram, nammAzhwAr explained that we need not seek out for separate tools to pursue him and we can simply use our body and senses which are given to us by him. In the ninth pAsuram, nammAzhwAr explained that by engaging body and senses for him, the hurdles for devotion towards him will vanish. In the tenth pAsuram, nammAzhwAr highlighted the manthram that is used to worship him. In this pAsuram, he says these not said without analysing; they are said after analysing the well-being of the jIvAthmA thoroughly. Alternatively, it is explained as something which is constantly meditated upon since it is for the well-being of the jIvAthmA. 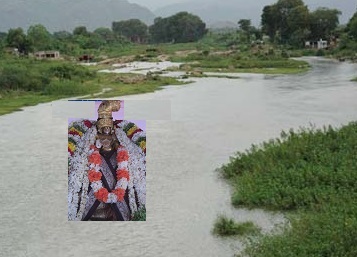 nammAzhwAr of beautiful AzhwArthirunagari which has abundance of ponds (showing rich and beautiful environment) blessed words/phrases which have nice form and meanings with poetic meter in this well-analysed decad in these 1000 pAsurams. It is also explained as “Orththa ippaththai sEr” – pursue this well-analysed decad. This decad is well-thought-out about emperumAn in this 1000 pAsurams which reveal bhagavAn‘s auspicious qualities. sEr is explained as a verb which indicates approach, bond with, etc. sIrththodai Ayiram – poetic aspects such as words, tune, etc. It is also explained as pAsurams which reveal collection (thodai) of auspicious qualities (sIr). Ayiraththu Orththa ippaththE – Among the 1000 pAsurams, the most well-wishing decad. Also, it is explained as the decad which analyses what is best for the jIvAthmA. Also, it is explained as the decad that is to be constantly meditated upon due to it revealing the best instructions for the jIvAthmA among the 1000 pAsurams. Thus ends the English translation for thiruvAimozhi 1st centum 2nd decad. This entry was posted in thiruvAimozhi, thiruvAimozhi 1st centum on May 23, 2015 by Sarathy Thothathri. In this ninth pAsuram, nammAzhwAr says that by approaching emperumAn the hurdles which stop us from reaching emperumAn will be destroyed. It is only delayed until the end of this body/life. Subsequently, nammAzhwAr explains the removal of hurdles which is the result of worshiping emperumAn. In this ninth pAsuram – Though worshiping emperumAn is easy, aren’t the anAdhikAla sanchithamAna avidhyA, etc (ignorance, vAsanA, ruchi, karmA, etc., which are accumulated since time immemorial) are hurdles for worshiping emperumAn? For having the thought “let us worship him” we only need sukrutham (virtue). By engaging in worshiping emperumAn due to that sukrutham, the hurdles will be eradicated fully. ninth pAsuram – In the previous 2 pAsurams, nammAzhwAr explained that one should not shy away from emperumAn since everyone is eternally related to emperumAn (pAsuram 7) and worshiping him is by engaging the senses given by him in his service (pAsuram 8). Are we not worshiping him due to lack of knowledge? We are actually not serving him due to our hurdles. nammAzhwAr says that by approaching emperumAn, the hurdles will go away. pinnum – After that, as explained in mahAbhAratham “kruthakruthyA pradhIkshanthE” (those learned persons who have completed all that is to be done and expecting). Give up everything unto the master (bhagavAn), eliminate avidhyA (ignorance), etc., which are the cause for the contraction of AthmA’s knowledge. After that, one can surrender to emperumAn and seek out for his kainkaryam at the end of the this life itself. It is explained as “Akkai vidumpozhuthu eNNa vENumO” (should we think about him at the end of our life?). Also, some explain this as a part of bhajanam (worshiping or more specifically bhakthi yOgam) saying “subsequently, think about him while giving up your life”. By engaging our senses in his kainkaryam always, all hurdles will be removed. After that, please wait until the current body dies – that is how long it takes to attain the ultimate result. odunga avan kaN – By you (jIvAthmA) who is prakArabhUtha (attribute/mode) becoming part of (approaching) bhagavAn who is prakAri (substratum for all such jIvAthmAs). Here becoming part of him is explained as giving up svAthanthriyam (independence) accepting oneself as fully subservient to him. odungalum ellAm vidum – When what is prAptham (apt/deserving) is pursued, aprAptham (inapt/undeserving) will be eradicated. When what is appropriate for the true nature is pursued, hurdles which are inappropriate for the true nature of jIvAthmA will naturally leave. “odungal” indicates that this independence is not natural for jIvAthmA. It can also be considered as “odukkal” became “odungal” – odukkal indicates binding jIvAthmA‘s senses in worldly pleasures. ellAm vidum – avidhyA (ignorance), karmA (action/reaction), vAsanA (impressions), ruchi (taste), etc., will all be removed. Remember periya thiruvanthAdhi pAsurams 54 “vAnO maRikadalO” (where did my sins go after pursuing kaNNan emperumAn) and 59 “mAdE varappeRuvarAmenRE valvinaiyAr” (Will great sins come close to me anymore?). If all hurdles leave him, what does he do? pinnum Akkai vidum pozhuthu eNNE – Instead of staying calm thinking “being confident of the upAsanam(devotion), the result will come”, one would anxiously be thinking “as all hurdles are removed, when would this body fall and achieve the ultimate result without any further obstruction”. Just like a lover would clean herself of sweat, etc., and be prepared to engage with her lover, jIvAthmA will wait for the removal of the material body to engage with emperumAn (in parampadham). ANdAL too decorated herself and said in nAchchiyAr thirumozhi 8.7 “kongai mEl kungumaththin kuzhambazhiyap pugunthu oru nAL thangumEl ennAvi thangum” (When emperumAn comes and embraces me such that the sandalwood pasted applied on my breasts are effectively useful, my life will be sustained) and waited for emperumAn. As explained in thiruviruththam 1 “azhukkudambu” (dirty/material body), when will this body be removed and the ultimate result be achieved? As explained in mahAbhAratham “krutha kruthyA: … mruthyum priyamivAthidhim” (one who has performed what is to be done, waits eagerly for mruthyu dhEvathA – the dhEvathA for death). krutha kruthyA: means one who has accepted that emperumAn is the means to achieve him (pursued the sidhdhA sAdhanam – established means). This is explained in mahAbhAratham also “one who knows krishNa truly, are the ones who have performed all that is needed to be performed”. 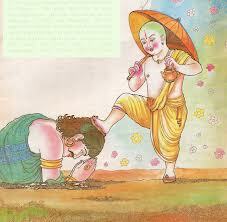 Once on ayanam (varusha pravEsam – new year day), kunRaththu jIyar approached emperumAnAr and worshiped his lotus feet. At that time emperumAnAr says “singappirAn! today is an ayanam”. jIyar does not understand the emotions of emperumAnAr and looks at him curiously. emperumAnAr says “Once it is sure that the ultimate result will be achieved at the end of this life, an year of those days of waiting is gone! Isn’t this a happy aspect to celebrate for you?”. Another time, embAr gives a different view point for this – “When the cause of this samsAram, i.e., avidhyA, etc., is eradicated, wouldnt the effect, i.e., the body be naturally eradicated? Wouldn’t the result be accomplished surely? so, what is there to worry about the eradication of this body?”. What tools are to be used to perform kainkaryam? In the 8th pAsuram, nammAzhwAr explains the method of worshiping/serving bhagavAn. When asked “when we consider oneself as part of his wealth, we realize our existence and realize that we have our senses. Would we not need other tools to worship him?”, nammAzhwAr explains the method of worshiping/serving bhagavAn. uLLam – mind which is used for meditation, etc. urai – speech which is used for verbal glorification, etc. seyal – body which is used for prostrating, etc. Understanding the purpose of mind, speech and body which we have from the beginning and that are readily available to us, give up the attachment towards worldly pleasures and become totally subservient towards the master who is apt for us. Here, mind, speech and body are focussed on their respective actions. “uLLi keduththu” – this is also explained as “meditate upon the previous actions (of engaging in worldly pleasures) and give up such attachments”. Instead of having to earn the tools, the tools to worship emperumAn (mind, speech and body) are already given to us for engaging them in bhagavath vishayam. Meditating upon this aspect, give up attachments towards other aspects and engage them fully in bhagavath vishayam. uLLam urai seyal – When the mind which is attached to external pleasures is turned inwards (towards the true nature of jIvAthmA), it becomes favourable for meditating upon bhagavAn. When such meditation deepens, it overflows through speech as explained in thiruvAimozhi 8.10.4 “pongEzh pugazhgaL vAyavAy” (the glorification of his auspicious qualities that was an outcome of the overflowing experience in mind). The body facilitates falling on emperumAn‘s lotus feet and worship him as explained in srI rAmAyaNam kishkinthA kANtam 4.12 “guNair dhAsyamupAgatha:” (serving srI rAma being overwhlemed by his auspicious qualities). uLLa immUnRaiyum – already existing these three facilities. sEshi (master) himself gave this to the jIvAthmAs to serve him so the jIvAthmA need not look for external tools. Here, iraNdAm thiruvanthAdhi 21 “thAmuLarE” and mudhal thiruvanthAdhi 95 “nAvAyiluNdE” pAsurams need to be remembered. uLLik keduththu – Analysing the purpose of these senses and body which are engaged in worldly pleasures, one needs to pull them back from external pleasures and engage them in bhagavath vishayam. iRai uLLil odungE – Like a farmer who diverts the water from being wasted into dry lands to being used in fertile crops, one should engage these senses and body in bhagavath vishayam which is apt for the true nature of the jIvAthmA instead of letting them go astray. odukku (control/engage) has become odungu. nampiLLai beautifully explains iraNdAm thiruvanthAdhi 21 “thAmuLarE” pAsuram here. thAmuLarE – one exists – one need not go and search for oneself anywhere. thamuLLam uLLulLathE – one need not go an acquire mind from elsewhere to meditate upon emperumAn. When one exists, ones mind exist with oneself too. thAmaraiyin pU uLathE – emperumAn also created lotus flowers which can be easily plucked and offered to emperumAn. Considering emperumAn‘s greatness and magnanimous nature, all flowers will be accepted by him as explained in periya thirumozhi 11.7.6 “kaLLAr thuzhAy” pAsuram. Eththum pozhuthuNdE – emperumAn created time as well. We need not purchase it from anywhere. We have all the time in our disposal. vAman – He became vAmana and begged for his own property from mahAbali. So, he is willing to accept our offerings by all means. 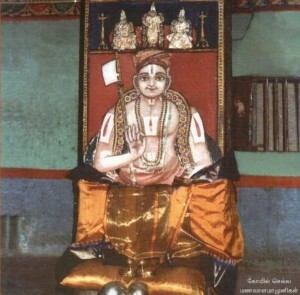 thirumaruvu thAL – His lotus feet which highlights his wealth. This thiruvadi which is so tender as explained thiruvAimozhi 9.2.10 “vadiviNai illA malarmagaL maRRai nilamagaL pidikkum melladi” (the most tender feet of emperumAn which is massaged by the most beautiful srI dhEvi and bhUdhEvi). maruvu senniyarE – behold it in ones head fully. This head is given by him to accept his lotus feet on it. sevvE aru narakam sErvathu arithu – When vAman (One who is so compassionate that he kept his lotus feet even on the heads of nithya samsAris who are fully immersed in worldly pleasures) is present, how can one give up this opportunity and seek out worldly pleasures? Here samsAram (this material realm) itself is identified as aru narakam (most difficult hell). This entry was posted in thiruvAimozhi, thiruvAimozhi 1st centum on May 20, 2015 by Sarathy Thothathri. If we approach emperumAn, would he accept us? Is he not the supreme lord (too high to consider engaging with us)? Would Iswara who has many distinct followers accept some one like us who is just approaching emperumAn now? Subsequently, nammAzhwAr explains emperumAn‘s equality towards everyone. Even if we give up everything and approach him, since he is sarvEsvaran (supreme lord), would he acknowledge us? Considering his easy mingling nature with everyone, even his supremacy will look like vandhERi (accidental – acquired) for him. In the previous pAsuram, nammAzhwAr explained remedy for internal hurdle. When asked “Since he is explained as the one who has no unfulfilled desires and the master of everyone, would he be attainable by us?”, AzhwAr replies “He is already naturally interested in engaging with others”. muRRil – his qualities of being dhAraka (sustaining), pOshaka (nourishment), bhOgyam (enjoyment), etc. 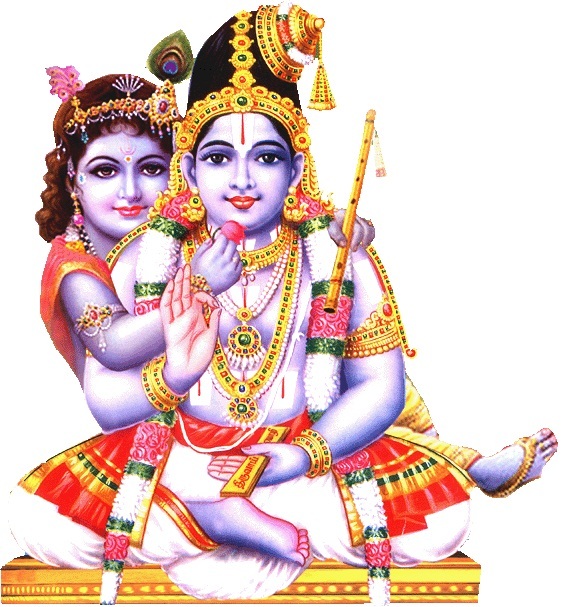 Even though he is savEsvaran, giving up attachments towards his divine consorts, nithya sUris, etc who are already attached to him , he firmly stood attached fully to us (who are newly approaching him) considering us to be that which sustains him, that which nourishes him and that which gives him pleasure. You too giving up worldly attachments and become immersed towards him considering his qualities of being dhAraka (sustaining), pOshaka (nourishment), bhOgyam to us. It is also explained as – Even though being sarvEsvaran, he is having attachment towards us and standing firmly on that as explained in bhagavath gIthA 9.24 “samOham sarvabhUthEshu” (I am equal to all entities). You too become firmly attached towards his true nature, auspicious qualities, forms, activities, etc. Even though he is sarvEsvaran, whoever approaches he will manifest friendship. So, you too approach him with friendship and serve him by all means. paRRilan – one who has attachment. Its explained as paRRu + il (abode or residence of attachment). “paRRilAn” is shortened to be “paRRilan“. It is like – “innAn ingu uNdO?” (is that person here?). “ingu illai avan. agaththilAn” (He is not here. He is at home). This is based on piLLAn‘s second/alternative explanation of paRRilan being explained as “one who has attachment”. prasAdha paramau nAthau – you both are most compassionate and easily approachable – it looks very rare for such supreme persons. 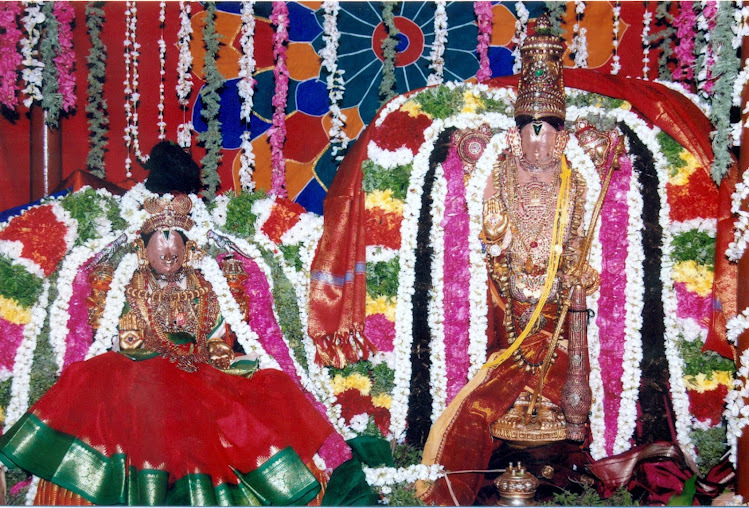 mama gEyamupAgathau – When the great masters are served by their servants, your compassion is very clearly visible by your visit to this humble residence in a narrow lane. dhanyOham – being most fortunate like some one finding a great treasure in the same street where he passes by everyday. archchayishyAmi – I will engage in what is natural servitude for me. 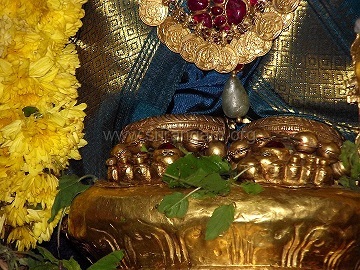 ithyAha – rishi (sage – speaker) is being amazed at mAlAdhara’s (flower vendor) words which resemble the words of nithyasUris as explained by nammAzhwAr himself in thiruviruththam 21 “sUttu nanmAlaigaL thUyana Endhi” (nithyasUris holding up the pure and good garlands). muRRavaum ninRanan – As explained in bhagavath gIthA 9.24 “samOham sarvabhUthEshu” (I am equal to all entities), he treats all his devotees equally irrespective of the quality of the ones who approach him. 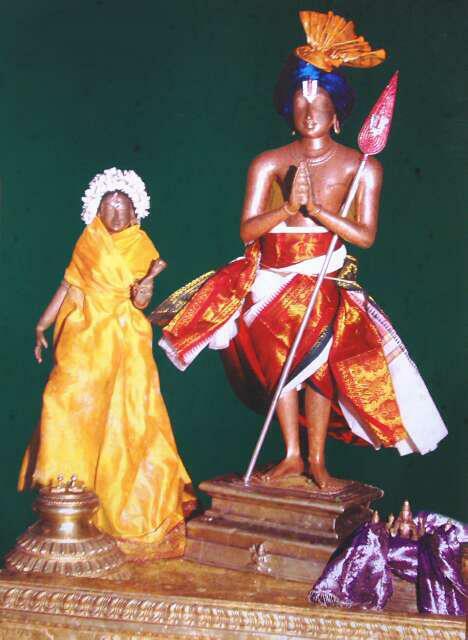 avan muRRil adangE – As said by srI lakshmaNa to srI rAma in srI rAmAyaNam ayOdhyA kANtam 31.25 “aham sarvam karishyAmi” (I will serve in all ways), one should engage in kainkaryams to emperumAn. nampiLLai also highlights bhattar‘s explanation which is also most elegant. parrilan Isanum – Though he is the abode of all auspicious qualities residing in paramapadham, he is not attached to even nithyasUris. muRRavum ninRanan – Does that bother him? No. He is greatly glorified while accepting a devotee who approaches him for the first time. This is explained beautifully using srI rAmAyaNam yudhdha kANtam 41.4 “…thvayi kinchith samApannE kim kAryam sIthayA mama” (srI rAma to sugrIva, after sugrIva tries to hit rAvaNa and returns back – even if you are hurt a little bit, what is the use of getting sIthA back?) – For an animal (sugrIva being a monkey), srI rAma is willing to give up his eternal companion (sIthA pirAtti). When a cow gives birth to a new calf, to protect that calf, she will push her other calves away – similarly emperumAn also greatly protects ones who approach him newly. paRRilaiyAy – He was ready to ignore nithyasUris for you. Why cant you give up everything else for him? “… EkaikapalalAbhAya sarvalAbhAya kEsava:” (When attaining father, mother, etc., they fulfill one particular purpose; When attaining kEsava, all purposes are fulfilled). This entry was posted in thiruvAimozhi, thiruvAimozhi 1st centum on May 17, 2015 by Sarathy Thothathri. “மகி ஸமர்ப்பணே” (கதௌ) என்னும் தாதுவடியாகப் பிறந்த மங்களம் என்னும் சொல் கம்யம் (அடையப்படும் பயன்) என்ற பொருளையும், இலக்கணையினால் அதற்கு ஸாதனமான உபாயத்தையும் காட்டுகிறது. இது “கவேர கந்யாயா: அங்கே” என்றவிடத்திலும், “ரங்கேதாம்நி” என்கிறவிடத்திலும் பொருந்துகிறது. இரண்டும் நமக்கு அடையப்படும் பயனாகவும் மற்றுமுள்ள பயன்களுக்கு உபாயமாகவும் ஆகக் குறையில்லையல்லவா? ‘ரங்கம்’ என்ற சொல் எம்பெருமானுக்கு ப்ரீதியை உண்டாக்குமிடம் என்னும் பொருளைத் தரும். ‘ஸுகாஸீநம்’ என்பதனால், மணவாளமாமுனிகளின் அவதாரத்திற்குப்பின்பு துலுக்கர் முதலியோரால் ஸ்ரீரங்கத்திற்கு எவ்வகையான உபத்ரவமுமில்லை என்பது ஸூசிப்பிக்கப்பட்டது. எம்பெருமானார் காலத்தில் சைவர்களாலும், பிள்ளைலோகாசார்யார், வேதாந்ததேசிகர் ஆகியவர் காலத்தில் துலுக்கர்களாலும் உபத்ரவம் நேர்ந்ததுபோல் மாமுனிகள் காலத்தில் யாராலும் எந்த உபத்ரவமும் உண்டாகவில்லை என்றபடி. ‘வதி – அபிவாதந ஸ்துத்யோ’ என்று தாதுவடிவாகப் பிறந்த ‘வந்தே’ என்னும் வினைச்சொல், உடலால் தரையில் விழுந்து வணங்குதலையும், வாயினால் துதித்தலையும் நேராகக் குறிப்பிட்டு, இவ்விரண்டும் மணவாளமாமுனிகளைப் பற்றிய நினைவில்லாமல் நடவாதாகையால், பொருளாற்றலால் நினைத்தலையும் குறிப்பிட்டு, காயிக வாசிக மாநஸிகங்களான மூவகை மங்களங்களையும் தெரிவிப்பதாகும். This entry was posted in Other, thamizh, varavaramuni dhinacharyA on May 17, 2015 by sundara varadan. ஸ்ரீ வரவரமுநிதாஸரென்னும் மறுபெயரையுடைய தேவராஜகுருவாகிய எறும்பியப்பா ‘குரு என்பவர் ஸாக்ஷாத் நாராயணாவதாரமாகையால் அவருடைய திருநாமத்தை எப்போதும் ஜபிக்கவேண்டும். அவருக்கு வசப்பட்டு வாழவேண்டும். அவரிடத்தில் பக்தியைச் செலுத்தவேண்டும்.அவருடைய அன்புக்கிலக்கானவற்றில் அன்பு காட்டவேண்டும். அவருக்கு ஒரு வருத்தம் நேரிட்டால் மிகவும் வருந்தவேண்டும். அவருடைய திருநாமத்தையும், குணங்களையும் த்யாநம் செய்து மகிழவேண்டும்.தேவதையினிடம் பக்தன் போன்றும், அரசனிடம் வேலையாள்போன்றும், ஆசார்யனிடத்தில் ஶிஷ்யன் விநயத்தோடு கூடியவனாய்ப் பணிவிடை செய்யவேண்டும். நாம் ஆசார்யனுக்கு தாஸர்கள் என்று பெருமைப்படுதலும், ஆசார்யனைப் பின்செல்லுதலும் அவருடைய குணங்களைப் பிறர் சொல்லக்கேட்டலும், தானே சொல்லுதலும், நினைத்தலும் ஶிஷ்யன் செய்யத்தக்க செயல்கள்’ (?) என்றுள்ள உயர்ந்த ஶிஷ்யனைப்பற்றிய ஶாஸ்த்ர வாக்யங்களை அறிந்தவராகையாலும், எல்லையற்ற ஆசார்யபக்தியின் பெருமையாலும், தம்முடைய ஆசார்யராகிய பரமபூஜ்யரான மணவாளமாமுனிகளைப்பற்றி சதகம், காவ்யம், சம்பூ முதலிய க்ரந்தங்களைத் தாம் இயற்றியிருந்தபோதிலும் அவற்றால் த்ருப்தியடையாமல் ‘குருவின் நித்யாநுஷ்டாநங்களையும் வருணிக்கவேண்டும்’ (?) என்ற ஶாஸ்த்ரத்தினால் தூண்டப்பெற்ற அதிகமான பற்றையுடையவராய்க் கொண்டு அம்மணவாளமாமுனிகளையே இலக்காகப் பெற்ற திநசர்யை (நாள்தோறுமுண்டான அநுஷ்டாநத்தைப்பற்றிய நூல்) என்ற க்ரந்தத்தை இயற்றத்தொடங்கி, செய்யப்போகும் க்ரந்தம் இடையூறேதுமின்றி முடிவு பெறுவதற்காக, தமது ஆசார்யபக்தியென்னும் பெரிய தகுதிக்கேற்ப, ஆசார்ய நமஸ்காரரூபமான மங்களத்தைச் செய்தருளுகிறார். ‘அங்கே கவேர’ என்று ஶ்லோகத்தினால். இத்திநசர்யை என்ற நூல் ஜ்ஞாநம், அநுஷ்டாநம், வைராக்யம் முதலிய நற்குணங்களனைத்தும் நிறையப்பெற்றுப் பங்க்திபாவநரான (ஒரு கோஷ்டியை முழுவதும் பரிஶுத்தமாக்கும் பெருமையையுடையரான) மணவாளமாமுனிகளைப் பற்றியதாதலால், தானும் பங்க்திபாவநமாய்க்கொண்டு ஶுத்தமான ஸத்த்வகுணத்தில் நிலைபெற்ற பரமவைதிக ஸ்ரீ வைஷ்ணவர்களால் அநுயாக ஸமயத்தில் (கோஷ்டியாக இருந்து பகவத் ப்ரஸாதத்தை ஸ்வீகரிக்கும் ததீயாராதன ஸமயத்தில்) முதன்முதலில் அநுஸந்திக்கப்பட்டு வருகின்றமை ஸம்ப்ரதாயஸித்தமாக உள்ளது. ஒருபெரிய ததீயாராதன கோஷ்டியில் நல்லறிவும் நன்னடத்தையும் இல்லாத ஒருசிலர் இருந்தால் அக்கோஷ்டியின் தூய்மை கெடுவதற்கு ப்ரஸக்தியுள்ளமையால், அத்தூய்மையின்மையைப் போக்கித் தூய்மையை அதிகமாக்கவல்ல பெருமயைப்பெற்றவர் பங்க்திபாவநரான மணவாளமாமுனிகள், அவரைப் பற்றி இந்தத் திநசர்யையும் பங்க்திபாவநமென்பது பெரியோர்களின் துணிபு.